Julian is in the market for his first car and unlike the rest us nutjobs he doesn’t want to buy a $700 Jeep that is two decades old. His goal is to get the newest and safest ride that has some all-weather capability for less than $10,000. What car should he buy? I’m ready to buy my first car but I don’t want something too old and unreliable that I have to keep fixing. I would prefer something newer at least 2014 if possible that has some modern safety features and conveniences like Bluetooth and heated seats. I would like the car to be capable in the wintertime for when I need to drive in the snow, and get decent gas mileage. It can be a manual or automatic. The problem is my budget is kind of tight and I only have up to $10,000 to get something good that is not too old, but I also don’t want something with too many miles either. Well, Julian, you have a pretty long list of parameters and a fairly modest budget. Now before I go any further, I think it is important to dispel some used car buying myths. A newer car with low miles does not automatically equal reliable, and an older car with higher miles isn’t necessarily going to cause you problems. The build quality of the vehicle and how well it was maintained are the most important factors. Too many people fall into the trap of newer equals better and they arbitrarily exclude some really good options. That being said, since my colleagues will likely ignore most of your criteria, I tried to come as close as possible, by suggesting a 2015 Kia Soul. These wagony-hatchbacks aren’t fancy nor are they fast, but they are comfortable, well built, and fuel efficient. It doesn’t have all-wheel-drive for Minnesota winters, but you already know that a good set of winter tires will get you through just fine. This particular example maxes out your budget but only has 66k miles. Now the one thing I did notice crawling your local Craigslist is the number of cars for sale that looked good but had rebuilt titles. These can be decent values for someone who knows what they are doing but be careful with something that looks too good to be true. When it came time for me to buy my first car, I actually had a similar but opposite thought: I wanted the newest, oldest car I could buy. I settled on a 1970s Volkswagen, as it was basically the newest car from the 1930s that I could get my hands on. No other car was going to be as new and also as simple as the Bug. Simple did not mean cheap, though, as the car took a ton of money in body work after it ended up on its roof and more yet in constantly-failing parts through its lifetime. Still, it’s a good concept and it directed me to the Lexus LS, about as big and bountiful a car as you’re going to get for next to no money. The only V8-powered superlux sedan you’re going to get in your price range is from the mid 2000s (it’s not hard to find ones from between about $3,000 and $10,000), which I can understand looks a little dowdy. In that case, it turns out the smaller Lexus IS, a fine and lovely car, has depreciated right into your price range. Cars like this one are cheap as hell for what they are, and though they’re older than you’d like, they look newer than they are. Keep them in mind, unless you find a steal on a big LS. Look, I gotta be honest here: you’re going about this all wrong. Newest + least miles + cheapest = the most sad, boring, miserable hunk of crap you’ll ever be saddled with. Okay, sure, it’ll likely be more reliable than getting something older and more worn and with more character, but every mile you drive in it will be like feeding your soul another drop of poison. That said, it’s your challenge, and I don’t back down from these, and I think I found at least three cars that will work. 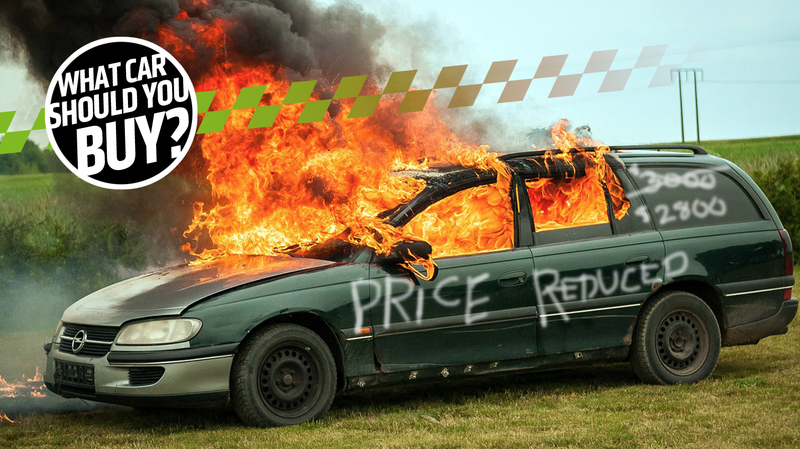 It seems there’s two crucial elements needed to get a new-ish car seriously cheap: undesirability and damage. For the undesirability side, there’s this remarkably decent-seeming 2013 Prius C for an incredibly cheap $3500! These cars are, of course, great on gas and generally reliable. Of course, they’re also complete sleeping pills, and, for some reason, this one is partially vinyl-wrapped in green, which makes it look a little like a Mexico City cab. Maybe that’s why no one wants it? Who cares, it’s perfect for you! The other way to get new and cheap is to look for something that has some mostly cosmetic damage. This 2014 Spark is only $3295 because it has some damage to both bumper caps and the front grille. All of the car in between the ends looks fine, though! That’s not so bad! If you’re feeling rich, this 2012 Focus had damaged that was repaired and is now only $4999! Look, there’s three options for you! I say go for the cheapest, drive it until you just can’t stand it anymore, and then orchestrate some elaborate accident/insurance fraud deal, and go get something less soul-crushing. Your first car has to be awesome. The difference between someone falling in love with car culture and that someone becoming a completely apathetic Camry-driver often times comes down to how cool their first vehicle was. So don’t buy a boring luxury sedan or an econobox; what you need is a V8 motor and rear-wheel drive. It’s that simple. And, lucky for you, this great country of ours has a surplus of V8s driving rear wheels, mostly because our police forces, understandably, prefer that setup. So pick up the ex-police cruiser shown in the picture above. It’s a 2014 Charger with a 5.7-liter Hemi V8 sending 370 horsepower to the rear wheels. At only $8,500, it’s suspiciously cheap (so be careful, there), but maybe that’s because of the 102,000 miles on the clock—something that wouldn’t bother me if the car was well maintained (as it should have been if it’s an old police cruiser). You need power. You need donut-capability. You need that Charger. And so do I.